Small volumes of anti-ACADS antibody vial(s) may occasionally become entrapped in the seal of the product vial during shipment and storage. If necessary, briefly centrifuge the vial on a tabletop centrifuge to dislodge any liquid in the container`s cap. Certain products may require to ship with dry ice and additional dry ice fee may apply. Western blot analysis of extracts of various cell lines, using ACADS antibody at 1:1000 dilution. 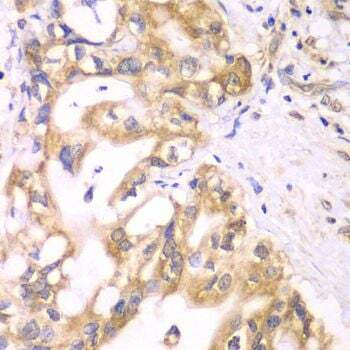 Immunohistochemistry of paraffin-embedded human liver cancer using ACADS antibody at dilution of 1:100 (40x lens). 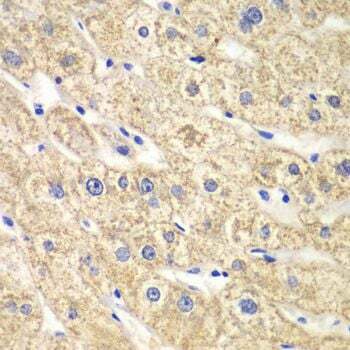 Immunohistochemistry of paraffin-embedded human liver injury using ACADS antibody at dilution of 1:100 (40x lens). Immunofluorescence analysis of U2OS cells using ACADS antibody. Blue: DAPI for nuclear staining. NCBI/Uniprot data below describe general gene information for ACADS. It may not necessarily be applicable to this product. ACADS: Defects in ACADS are the cause of acyl-CoA dehydrogenase short-chain deficiency (ACADSD). It is an autosomal recessive disorder resulting in acute acidosis and muscle weakness in infants, and a form of lipid-storage myopathy in adults. Belongs to the acyl-CoA dehydrogenase family. 1. 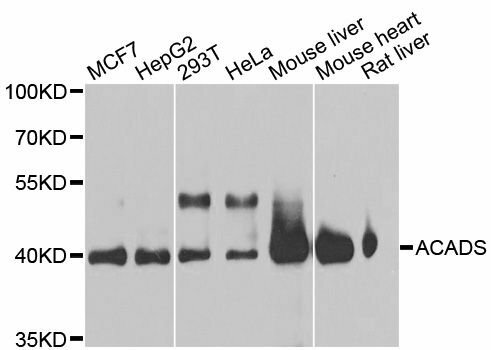 IVD mutations in Asian populations are distinct from these in Western populations.